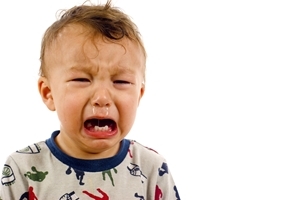 Whining children can be an awful part of parenting. But an important aspect of fatherhood is practicing patience. Taking a second to calm yourself before dealing with the situation can make all the difference. The next step is teaching your children that whining is not the way to communicate. Children whine because they don't have the same capacity to control emotion as we do. Knowing that helps us better comprehend that children aren't making a fuss to make a fuss. They want or need something and can't contain their feelings. At this point, it's equally important for you to teach your children to take a moment and relax. Explain why whining doesn't get anywhere and that a better, more relaxed tone will allow you to understand their needs and tend to them. One method is to show your children the difference between whining and calmly asking. You can give examples to give them a better idea of what you expect. The next time they whine, remind them to take a second and revisit their approach. With practice and patience, your children may stop whining altogether.